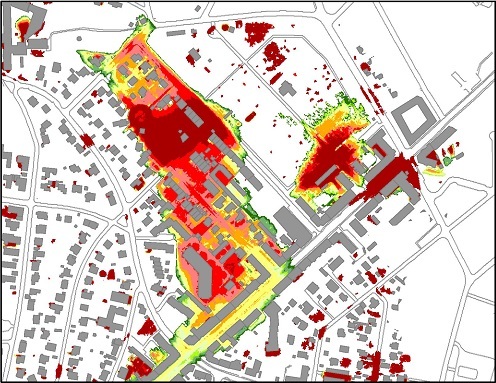 A new digital tool allows users to identify drainage patterns from deluges and identify highly vulnerable areas - for free. The tool has been developed by a University of Copenhagen geographer with a flooded basement tale of his own. Maelstrom shows which buildings are in critical locations. There is little doubt in anyone’s mind that cloudbursts will become ever more frequent events in Denmark’s future, and that every monster rain will also spawn monstrous repair bills for a great number of people. University of Copenhagen Researcher and Associate Professor Thomas Balstrøm of the Department of Geosciences and Natural Resource Management knows this all too well from personal experience. "My cellar flooded during the 2011 cloudburst over Copenhagen. A low-lying area of our garden rapidly filled with rainwater, water that eventually spilled through the cellar walls. This idea was born from that event," says Balstrøm, developer of the GIS-based tool that goes by the name "Maelstrom". His idea was to develop a tool that presented an overview of the routes that water takes during cloudbursts and provide a map of where water will pool. By doing so, users can identify which buildings, roads, tunnels and installations are in critical locations. Maelstrom makes this possible. "When a municipality needs to find out where water will flow during torrential rains, they typically rely on an engineering firm to perform an analysis. This is an expensive proposition from the get go. Maelstrom is a tool that allows you to gain a quick overview, on your own, before resorting to more extensive and expensive solutions," according to Thomas Balstrøm. The tool is based on a publicly available elevation model. It uses a digital map to show where low lying hollows are and where runoff will pool during cloudbursts. The map also details how many millimeters of precipitation are needed to fill individual depressions in the landscape and where overflow will run from there. In short, Maelstrom maps waterway networks. The information is useful for building planning, climate renovation projects and for anyone who needs to effectively position emergency preparedness resources for cloudbursts,” points out Thomas Balstrøm. Maelstrom is on the verge of being fully-fledged. The only thing left to do is implement the method in an open-source environment. Maelstrom is intended as a free product that is untied to commercial interests. "The idea is that Maelstrom should be available to all – both here at home, as well as in developing nations, so that anyone in any sector can gain an initial appraisal before spending money on more in-depth research. This type of screening tool, one that runs on an ordinary PC, is currently nonexistent," says Balstrøm. "I think that there is a significant and unmet demand because of the wide variety of actors who are affected when cloudbursts occur. These might be landscape architects, those working on climate renovation projects, public agencies, the Danish State Railways, the Danish Road Directorate, and even energy companies. If you have electrical enclosures in low lying areas, they will simply explode when flooded. And that costs a fortune for energy companies", concludes Balstrøm. Maelstrom is a collaborative development between the University of Copenhagen, the Danish Agency for Data Supply and Efficiency (SDFE) and Septima P/S. The Maelstrom software is now being tested internationally, in Accra, Ghana, for a DANIDA project that seeks a better overview of rainy season flood patterns, and in particular, to predict how infrastructure and human mobility will be affected by floods.